SlugFest Games - Ending Your Turn for Fun and Profit! Makes sense. Although, in your example about Erin turning into a Tree in order to negate “Tip the wench,” I don’t think that’s how I would resolve it in a game that I’m running. I tend to view Anytime cards in sort of a separate way from other cards. So, in the scenario you posited, Erin turning into a Tree would negate both her drink and Gerki’s Mickey. But I would view the “Tip the Wench” as a separate issue that would resolve either before or after Erin resolves the drink, her choice. 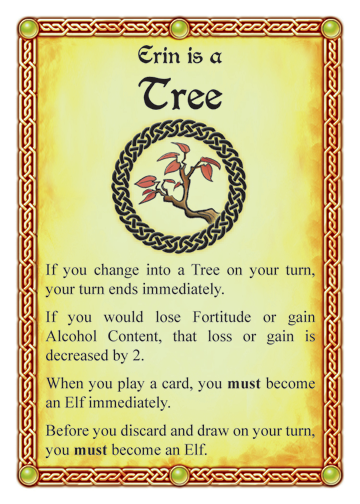 So, if Erin wanted to play “Have this trinket instead” (which would turn her into a Raven) to avoid tipping the wench, she could either do that before turning into a Tree and negating her drink or afterwards. (If she waited until afterwards, she would, of course, turn from a Tree into a Raven.) 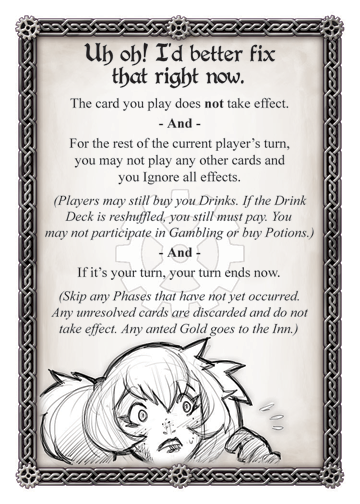 Since “Tip the Wench” is an Anytime card not tied to any specific phase that Erin is in, I would not say that it goes away simply because that phase of her turn was interrupted. I agree that the example is a bit contrived. Since an experienced player would know to wait until after “Slip a mickey” resolved to play “Tip the Wench”, I would probably agree with you in a casual game (which is pretty much all games of RDI). The point of my example was to point out that if the Fiona player really did want to play “Tip the Wench” before “Slip a mickey” resolves, then Erin Wildshaping to Tree would function as described. I recently came across another issue involving Wizgille’s turn-ending Gear Card. Typically, right before my turn “officially” begins, I use all my Anytime cards so I can draw more cards when my turn starts. This time, I got Wizgille’s Gear Card while doing that. Would that mean my turn is already over before I even got to draw, or does the “current player’s turn” apply to the previous player’s turn that just ended. In this situation, it simply comes down to player choice. 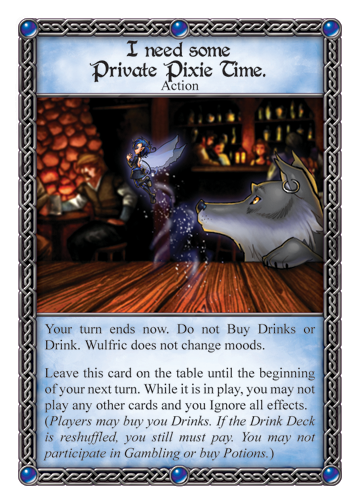 Were you playing your anytime cards at the end of the previous player’s turn? Then “Uh oh…” fires, you start your turn, and then play normally. If you were playing your anytime cards at the start of your turn, then when “Uh oh…” flips, your turn would end immediately. So, to play it safe, always make sure that it is clear you are playing your cards at the end of the previous player’s turn, and you should be good to go!